Mommy? Why is that light on? Its DAYTIME! Specifically it was almost 6PM, rush hour. 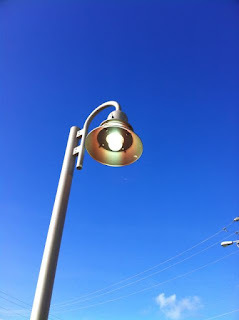 As you can see, it was a brilliant blue sky, a bright South Florida afternoon. So why is it on? 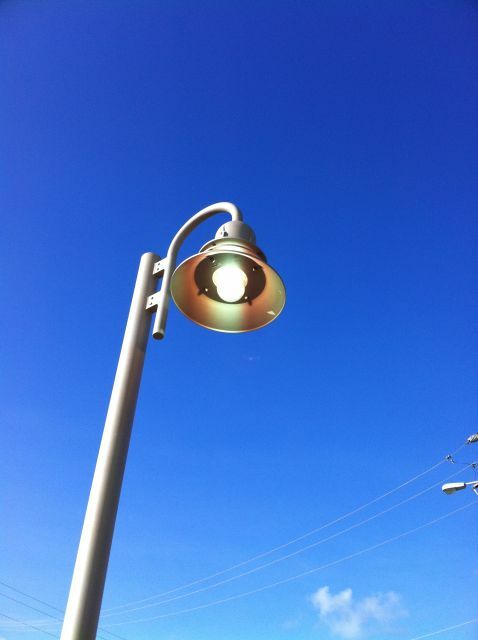 See the City of Wilton Manors was able to get these new "people centered" light poles put up on the Drive. From Five Points down to the South End at Richardson Park, we have these beige poles that remind me of a Art-Nouveau-Repro light standard from the 30s brought back to date. They're all Metal, so they'll stand up to the South Florida Weather, the lights are not your standard bulb, and they are much nicer looking than those evil looking Highway Lights that are all over the place. You know the Highway Lights that I'm talking about - the ones that were used as a design for the Martians in War of the Worlds in the movie back in the 50s? I see those lights and my mind thinks they can come alive at any moment and shoot sparks at something to make it glow red then turn to dust... BOO! Maybe not but they work very well. Three hours later, I was walking Mrs Dog past the Gables of Wilton Manors and noted that the sidewalks were very nicely lit, there were much fewer "dead zones" and the colors were truer than the ugly yellow Low Pressure Sodium Lights that we grew used to seeing in cities. The light has been on for the last few days, and they were all on this morning. The reason is that they're all in their burn-in period. They are required to be to make sure we don't have any that just don't work or are not installed correctly. The ones that I have seen are all turned on. When the period has ended and they're "normal", they will all turn off at dawn, back on at dusk. The sensors are set to save us some electricity in our bills as well as the bulbs being higher efficiency than the usual White lights. They look like they could be a Halide or High Pressure Sodium lamp, but I haven't been told. The color rendering is excellent at night, we all don't look like weird ghosts. Another feature is that they're centrally metered. What you didn't realize is that most cities pay an estimated bill. Count up the number of lights you have, multiply it by a factor and pay so much. That works if you use the old ugly lights but our new pretty lights being so high efficiency will save us money by our only paying for what we use. One last feature - the bulb sockets are normal "Edison" sockets like the one in the table light next to you... if you don't have a florescent light everywhere like I do. This means that in 5 years when LED lighting becomes cheap we can unscrew the old bulb and put in a fancy-schmancy light bulb that will save us even more. That is why it's on little girl. We're all happy now. Lets go walk home, ok?